Q - What can I auction - do my items have to be doggie related? A - Not at all! You can auction anything you wish, we just ask that all items are either new or in an 'as-new' condition! We, for example, have included quite a few 'human treat packs' for you to bribe, er, we mean, spoil your humans with! As with the wonderful GABE event earlier this year we are hoping for a huge variety of items - several items in GABE were home-crafted and our FH fell in love with a LOT of these crafted items - if she could have bought some of them she would have! Q - What currency should we auction our items in? A - The auction items that we have put forward we put in US dollars as we were initially not sure how 'big' this auction was going to be! As we're going to be using PayPal we now realise that we COULD have put our items up in our local currency of pounds sterling as PayPal will simply convert for us. Sigh - we blame our FH for being a bit dim, he he he! So, in short, you can put your items up for auction in any currency you wish! Q - Should I limit the cost of my auction items? A - We realise that we are going to have 3 distinct sections within this auction so please consider carefully which section you want your auction item to be place in. Firstly there is a 'fixed price specials' section - this is where most of our items are! We are limiting these items to an $8.00 limit so that most people can afford to bid on something, but most people realise that items in this section cost more than the fixed price so they're going to end up with a bargain! Secondly, we're going to include a 'deluxe' section - this will still be 'fixed price' but it will for items that are rather special that can command a higher price. Bidders will still end up with a great bargain, but the item they're bidding on will be a little more exclusive! And finally we're going to include a 'bidding' section where items can be put out for a 'free for all' bidding war! Please feel free to place your auction items and let's see how much money we can raise!! Q - Who pays for P&P? A - The person supplying the auction item will be expected to pay for the post and packaging so please bear this in mind. For example, you might notice that we have tried to keep our auction items light as we expect a lot of them to be going overseas. Q - Can I limit where I ship my items to? A - You sure can! For example, we know that the customs officials in Australia really like doggie treats and they're well known to pilfer packages and remove our noms! So we are specifying that our doggie treats can not be shipped to Australia. Also, if you wish to only send your item local to you this is absolutely fine - everyone will totally understand that if your item is heavy you won't want to be spending a fortune shipping it overseas. Q - Does it matter if we can only provide one item for the auction? A - Of COURSE it doesn't - don't be daft! We're providing a few items as our FH is a serial hoarder and we're demanding she has a clear out, he he he! 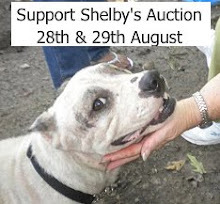 Q - I can't provide an auction item - how else can I help Shelby? A - Hey, don't fel bed if you can't provide an item to be auctioned! We want this auction to be friendly! If you can't provide an item why don't you bid on an item and bag yourself a bargain? 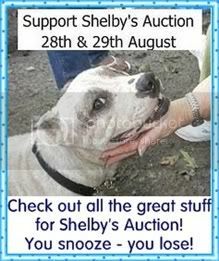 Or if you can't do this either don't worry - you can promote Shelby's auction on your blog and let others know about it. Everything helps and we are VERY grateful for all you do! Q - How will the bidding work when the auction goes live? A - We're still working on this! We're going to use PayPal and FH is going to spend the next week fiddling around with 'linking' and 'shopping basket' buttons, so we'll update this question when we know for sure what the answer is, he he he! But the auction itself won't go live until 28th August so you'll have plenty of time to browse the auction items before then. PLEASE NOTE - this Q&A section will be updated with new questions and answers as and when they come in! If you have a question please e-mail us at 'schnauzerandschnauzer@googlemail.com'!